Josiah’s birth story begins the weekend before he was born. I had been through a rough appointment with my OB’s partner (and the CNM at that, not the other OB). She wouldn’t let me leave the office without my c-section scheduled for 42 weeks, which was the following Thursday. I was overdue, swollen, tired and just ready to meet my baby boy. I posted to a few groups about my frustration and it was suggested to me that I look into acupuncture. So, on Friday afternoon I went in to see a local chiropractor who did acupuncture. We did a session, and I went home. We took the kids to the community pool after LJ got home and enjoyed some family time. Monday we didn’t do much. LJ went to work, I went to get more acupuncture done. I had some minor contractions, nothing that was enough to time and they were barely noticeable. I was supposed to go for more acupuncture on Tuesday, but had decided to spend the day at home working on cleaning the house, getting laundry caught up, everything I wasn’t going to be able to do the rest of the week come Thursday. Tuesday morning started like every other day. I fought to get out of the bed and got LJ ready to go out to work. When he left, I used my breast pump for a few minutes, trying one final time for the day to get labor started. Nothing. Not even a tightening. Jonas woke up and was hungry, so I put the pump up and started to get up to get him breakfast. And that’s when it happened. Right at 8:00AM. The telltale “pop” quickly followed by the gush… and gush… and gush. My water had broken! I called LJ and told him he needed to come back home. He had just pulled in his parking space at work! I called my mom to come get the kids, and called my doula, Carrie, to let her know today was the day. I called out for my sister (who had been staying with us to help me) to bring me a towel. I couldn’t move without gushing more fluid. We got the kids ready to go to my mom’s house, and I started making the cappuccino muffins I’d planned on bringing the nurses. By now my water had been broken for an hour and I started getting contractions. They started out slow, about every 10 minutes. I finished the muffins, then my mom arrived and took the kids. We kissed them goodbye, and our house was quiet. We didn’t want to jump the gun with going to the hospital, so we hung out at home for a couple hours. The contractions started to grow closer together, about 4-5 minutes apart. We decided around lunchtime to head on to the hospital. We waited for me to get something to eat (because I knew they wouldn’t want me to eat at the hospital), then we stopped by Taco Bell for LJ (there’s a first—contractions in the Taco Bell drive thru!) and headed on to St. Luke’s. On the way to the hospital, I listened to the “Easy First Stage” Hypnobabies track. It certainly helped make the trip down 95 a lot easier. We got to St. Luke’s, checked in and were sent to triage. I handed over the cappuccino muffins to some very happy looking nurses. Since I told them I was using my third towel to catch amniotic fluid, they didn’t bother checking to see if my water had truly been broken. Carrie arrived and we were soon transferred to a birth suite. I had several people come in and do some things. One nurse came in and asked about a million questions and had me sign a bunch of papers. One nurse came in and put me on the monitor. Another nurse came in and tried to start an IV. Fail. We asked to wait a bit, and stating something about being back because we needed it “in case of an emergency” she left. The anesthesiology nurse came in and asked a ton of questions and wanted me to sign the consent for anesthesia “in case of an emergency”. I got tired of hearing that phrase. When I asked to wait, he reluctantly accepted. He then offered to get my IV started. His first try was too close to a nerve and right as a contraction started, and I made him stop. His second try was an immediate success. We were left alone then for a while. LJ rubbed my feet with some oils Carrie had. It felt good. The contractions were slowly but surely getting more intense and closer. The room we were in was really hot. We asked for the temperature to be turned down, but apparently it was not working properly, so we were transferred to another birth suite. I walked to our new room, pausing for contractions. We got settled into the new room. With each contraction, I had an overwhelming nausea. LJ and Carrie each held a pressure point on my ears and it helped get me through. At one point, the nausea got to be too much and I asked for some Phenergan. It made me drowsy, but I was still able to focus during contractions on my relaxation, with LJ and Carrie’s help. With every contraction, one or both of them were there to use a relaxation cue and help me get into hypnosis. At this point, I had been checked and I was only at 1-2cm. The nurses had given me one or two bags of IV fluids, and at one point they wanted me to go to the bathroom. I got up and walked to the bathroom. I tried to sit on the toilet, but the intense pressure was way too much for me to handle. I just couldn’t sit down. I tried to go standing up, but that was a no-go as well. I told LJ I wanted something for the pain. I think he maybe thought I meant an epidural or spinal, because he tried severely to talk me out of it. He reminded me how important a natural birth was to me, and how I desperately wanted my VBA2C and pain medicine would possibly hinder that. I said I just wanted something in my IV. The nurse came in and said they needed me to use the bathroom. I said I couldn’t do it, and asked to be catheterized. They cathed me and Dr. VanScriver came in to check my dilation. She said I was 2-3cm. 2-3?! For real?? At this point I should at least be a 6! Why wasn’t I dilating quickly? I was relaxed during contractions… well, sort of… I later found out that she was being “generous” and I wasn’t really 2-3, more like still 1-2. I asked for something mild to take the edge off and help me focus again. She gave me Stadol in my IV. And that’s where everything goes fuzzy. I remember contractions. I remember being encouraged to “release”. I also remember Carrie leaving for a little bit. I remember seeing LJ and Carrie drinking Cokes and wanting one for myself. But, I also remember things that weren’t there. Like my oldest son giving me dirty looks, sitting in my living room. My mom and I talking in her kitchen. Other things that just weren’t happening, and I remember responding to them, and then being brought back to reality when LJ would ask me why I was asking him why he was looking at me like that, when he was across the room talking on his phone. That’s about all I remember of my experience with Stadol. Carrie later informed me that they were able to let me listen to several Hypnobabies tracks and I was a lot more focused afterward. She got to go pump for her baby, they ate dinner and got to get ready for what was coming. The room had quickly transformed from the pretty suite into a “procedure room” look. All the birth tools the doctor would need (and wouldn’t need but were there “in case of an emergency”) were ready and waiting. I was given the go-ahead to start pushing, although I think my body had been doing some of that on its own. I tried to find a good position to push. I pushed on my hands and knees, but they lost the baby on the monitor and wanted me to move positions so they could read him. I tried to push lying on my side. I couldn’t even get on my side. The pressure I felt was way too much. So, I laid on my back in a semi-reclined position and pushed. They still had trouble getting Josiah’s heartbeat on the monitor. We got it settled, and I started to push. I pushed for a couple hours and kept accidentally moving the monitor, so the doctor asked to put in a IFM (screw in the head to monitor his heartrate). I didn’t want it, but if it kept the nurses from having to find his heart rate as I pushed, I would allow it. I was tired of the external monitor. I pushed some more. It was intense. I finally found a position that was moving him down and a routine that worked for me. I’d wait until I felt the urge to push. LJ and Carrie would grab my lower legs, I’d grab my thighs and push as long as I could. Then LJ and Carrie would each grab my ears to keep me from throwing up. I’d push again, then rest and Carrie gave me a sip of water and I’d put the oxygen mask on they gave me. The oxygen helped a lot. I heard someone say, “He’s crowning!” I felt his head and couldn’t believe I was so close to holding my baby! We pushed a few more times and the doctor tried to stretch my perineum out so he could get out. Nothing she or I could do would stretch it enough. He was stuck on my perineum for an hour. She numbed it and we tried pushing some more. I began to tear below my perineum, so the doctor said I would need to get an episiotomy. I begged to let me go one more contraction before cutting, and she let me. I couldn’t push him out though. So, she cut me. That sound is nauseating! And what does my wonderful husband do? Comment on how nauseating the sound is! I thought Carrie and I were going to beat him up! He quickly stopped commenting. Shortly after the episiotomy, I felt him move down even more. I think it was two or three more good pushes after that I felt intense stretching and pressure and then relief. He was out. He was here. He wasn’t really crying. I was scared to death. They suctioned him in between my legs, then put him on top of my chest as they cleaned him up and tried to get him to cry. He was moving, just not exactly pink and not wanting to cry. They let LJ cut the cord and took him over to the warmer. Those few minutes of silence were deafening. I was scared to death. I wanted someone to tell me what was going on. LJ would look over there. One of the nurses told him what was going on. Josiah would breathe and cry when they rubbed him, but when they stopped, he didn’t want to cry. They called the neonatologist in. Josiah had a fever of 102. They wanted to take him to the Special Care Nursery to make sure he wasn’t sick, didn’t have meconium, etc. I said ok, but I wanted to see him first. The neonatologist acted like I was crazy. Of COURSE I’d get to see him first! They brought him over to me. I kissed him. My littlest man. He was so wonderful, so beautiful. He looked just like his brother. I kissed him again and let them take him, escorted by his daddy. I laid there as the doctor stitched me up. I delivered the placenta about 25 minutes after Josiah. As soon as she was done, I sat up. I felt great! Well, yeah, I was sore. Really sore. I felt like a Mack truck had been run through me! But, compared to the c-sections? TOTALLY different! After a while, I got up and walked to the bathroom. Compared to being catheterized for 24 hours following a c-section, totally great! Carrie helped me back to bed, and got me my cell phone so I could be in contact with LJ. Different than the calm before the storm, the calm after was quite unique. All of the medical equipment was removed from the room. The nurses left, the doctor left, it was just Carrie and I. We sat on my bed mostly in silence. I was digesting everything that had happened over the last 19 hours. Every now and then I would say, “I can’t believe I did it.” She filled in a few details, like my true dilation the second time I was checked, what I did during my Stadol time, etc. I apologized to her for any bruises she may have on her arms. I was holding on pretty tight to her and LJ at one point. She said it was normal. She offered to help me shower, but I refused. I wanted to keep by my phone to make sure Josiah was ok.
About an hour after birth, I was getting anxious. I wanted my baby. I had lost an hour of his life. Yeah, he was with his daddy, and his daddy would make sure nothing we didn’t want him having would happen, but I wanted him. Skin to skin, nursing, with Mommy. I apologized to my nurse in advance, but I was going to be a trouble patient and insist on going to the special care nursery to be with my husband and son. She went to get a wheelchair, but returned to get the bassinette. Josiah was coming back to Mommy. They said he was going to be ok. His bloodwork was fine. They did an x-ray and would bring him back to me. LJ and Josiah came back. We got a picture with Carrie, and she left shortly after. Then it was just the three of us. And I cried. God is so good! 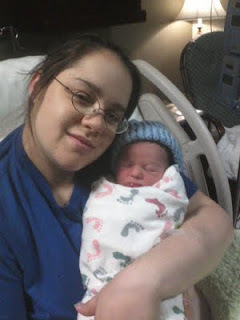 This entry was posted in Birth Stories, Good Enough to Share, Hospitals, Labor and Birth, VBAC. Bookmark the permalink. Trackbacks are closed, but you can post a comment.